Aerial view of an experimental field at Cedar Creek Ecosystem Science Reserve. Ecologists have long assumed that C3 grass species benefit much more from rising carbon dioxide levels than C4 species because their photosynthetic processes respond differently to atmospheric carbon dioxide concentrations. Both theory and field-based evidence have strongly supported this paradigm about C3 and C4 plants. There’s just one problem—the evidence for this paradigm has been based almost solely on studies less than ten years in length. 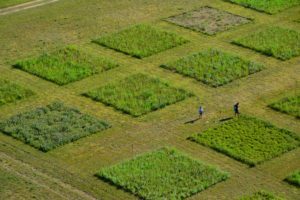 New evidence based on 20 years of research conducted at Cedar Creek LTER shows a reversal of the expected C3 versus C4 pattern in a carbon dioxide (CO2) enrichment experiment using grassland plots with each type of plant. Over the first 12 years, the observed pattern matched previous expectations: biomass increased with elevated CO2 in C3 plots but not C4 plots. But over the next 8 years, the pattern reversed: biomass increased in C4 plots but not C3 plots. The researchers found that long-term changes in soil nitrogen may be one of the underlying causes for the reversal. Globally, most plants are C3 species. Graminoids (grasses, sedges, and rushes) are the only major group with substantial abundance of both C3 (in which the first product of photosynthesis is a three-carbon molecule) and C4 (in which the first product of carbon fixation is a four-carbon molecule) species. Since C4 grasslands may contribute up to a fifth of the planet’s terrestrial primary productivity, understanding C4 versus C3 performance under rising CO2 levels with more accuracy will be critical to improving earth system models. Currently, most ecological models tend to incorporate the assumption that C3 plants respond more strongly than C4 to increased CO2 exposure. Over the 20-year experimental period, total biomass of C4 grasses became increasingly enhanced by elevated carbon dioxide (eCO2) exposure, while the reverse was true for C3 grasses. During the first 12 years (1998–2009), results were as expected: C3 plots averaged a 20% increase in total biomass at eCO2 relative to ambient CO2, in contrast to C4 plots that averaged a 1% increase. However, during the subsequent 8 years (2010–2017), the pattern reversed: C3 plots averaged 2% less and C4 plots 24% more biomass in eCO2 than in ambient CO2. The team found no evidence that this reversal was caused by changing patterns of rain over the study period. They did, however, discover that biomass of C4 and C3 species had a positive relationship with nitrogen mineralization (a process where nitrogen is converted from organic to inorganic plant-available forms). At first N mineralization increased more in C3 plots, but that trend reversed after a decade just as the biomass trend did. This pattern was more pronounced under eCO2 conditions, and especially for C4 plants. The next step for researchers will be to investigate why nitrogen mineralization followed this long-term pattern, and whether its relationship with plant biomass is consistent. This study shows that caution must be taken when translating short-term ecosystem responses into longer-term predictions. Surprising ecological patterns can emerge after decades or more, warranting the need for dedicated long-term experimental and observational research and continued re-assessment of long-held assumptions.